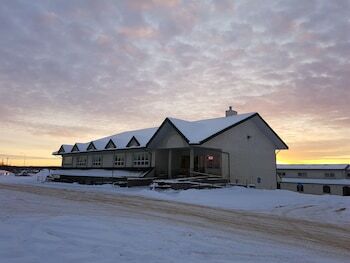 With a stay at Garden Court Motel in Manning, you'll be within a 15-minute walk of The Old Hospital Gallery and Museum and Family Worship Centre. Featured amenities include dry cleaning/laundry services, a 24-hour front desk, and luggage storage. Free self parking is available onsite. Located in Cranbrook, this vacation home is on a lake, within a 15-minute drive of Cranbrook History Centre and Tamarack Centre. Free self parking is available onsite. With a stay at Timberline Chalets & Lodges by FCR in Fernie, you'll be minutes from Fernie Alpine Resort and close to Coal Creek Heritage Trailhead. Free self parking is available onsite. With a stay at Shannon Motel in Fort Nelson, you'll be a 2-minute walk from Art Fraser Memorial Park and 5 minutes by foot from Fort Nelson Heritage Museum. Free self parking is available onsite. When you stay at Davis Bay Bed & Breakfast in Sechelt, you'll be 27.7 mi (44.5 km) from Whytecliff Park. Free self parking is available onsite. With a stay at Twin Lakes Retreat Bed & Breakfast in Sarnia, you'll be within a 10-minute drive of Canatara Beach and Park and Lambton Mall. Free self parking is available onsite. When you stay at Halls Cottages in Honey Harbour, you'll be within a 5-minute drive of Georgian Bay Islands National Park. Free self parking is available onsite.